I used to give my WordPress clients a book when we met for training. But as you’re aware, WordPress changes so often that a book just gets outdated right after it’s published! So a few months ago I started giving my clients the link to Easy WP Guide. It’s a great resource on how to use WordPress, and author Anthony Hortin does a great job of keeping it fresh and up-to-date with new major WordPress releases. It’s free and comes as a PDF you can save on your desktop or laptop for easy reference (don’t print it though – it’s big). 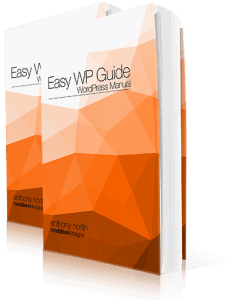 Get your copy of Easy WP Guide 3.1 here. Or, learn more about what’s changed in the latest version of WordPress.